Today, Memorial Day, the Paulists from the New York City area concelebrated a Memorial Day Mass at the parish cemetery in Milton, NJ. That is the cemetery to which were transferred last year the bodies of the many Paulists who had previously rested in the Paulist cemetery at the Paulist Novitiate at Mount Paul, Oak Ridge, NJ. Their transfer to the local parish cemetery was necessitated by the perhaps inevitable, but no less sad for that reason, sale of the former novitiate property to the State. After the Mass, we Paulists gathered for one last time at our old novitiate for a Memorial Day barbeque. Hosted by our new Vice President, Fr. Sean Foley, who has so expertly managed both the property and the transfer of bodies through this tragic time of transition, the barbeque was a wonderful celebration of Paulist community. It was, however, a bittersweet celebration, since it will likely be the last time most of us will ever set foot on that property, that special place where most of us once spent one of the most formative years of our lives. By now, the novitiate house itself has already been stripped of its furniture. 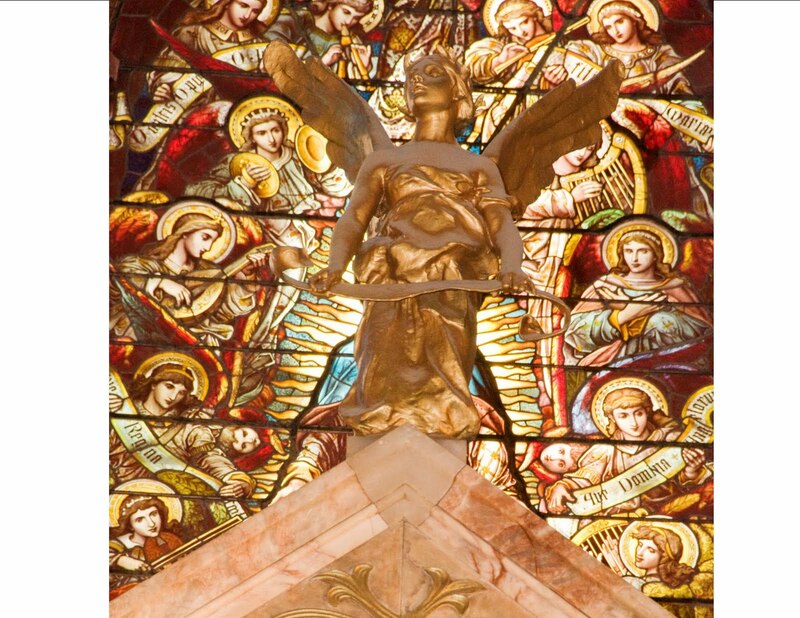 (Note the attached picture of the novitiate chapel, which gives a whole new meaning to “bare ruined choirs.” Much of the chapel furniture – including altar, pews, and statues – has thankfully already found a new home now here at St. Paul the Apostle in New York). I entered the Paulist Novitiate at Oak Ridge on August 24, 1981, and made my First Profession there on August 7, 1982. Subtracting the 2 months spent in another wonderful place since then also lost by the Paulists, the University Parish in Morgantown, WV, I spent 9+ months of my novitiate year at Oak Ridge. I understand that Mount Paul was not every Paulist’s favorite place, but it was certainly one of mine. In the late 1980s and early 1990s when I was at Good Shepherd and later working at 1011, I used to like to drive out to Oak Ridge on a day off to enjoy the company of the novices and the Paulist priests in residence – especially the late Jim Finley. After my ordination in 1995, I visited Mount Paul to celebrate Mass there, finally bringing my formations story to its belated but happy conclusion. I attended several Paulist burials there in the old cemetery and several First Professions – including the last one ever to take place there in August 1997. In recent years, I have gone there less often. With no novitiate there, the house seemed strangely empty – a place that seemed to have lost its purpose. Almost 30 years ago, when I was a Paulist novice, I sought some guidance from my confessor regarding my bumbling prayer life. He told me to pray personally – not just to God in general, but to each Person of the Trinity. At the time, I found his advice surprising - and somewhat perplexing. For me, the Trinity was always a bit of an abstraction – a doctrine I duly believed in, of course, but not something I gave a lot of thought to. I say this, despite the obvious fact that I was baptized in the name of the Father, and the Son, and the Holy Spirit, on which occasion my godparents on my behalf made a profession of faith in the Father, and the Son, and the Holy Spirit. My sins have been forgiven many times in the name of the Father, and of the Son, and of the Holy Spirit; and as a priest I have in turn many times absolved the sins of others in the name of the Father, and of the Son, and of the Holy Spirit. As a priest, as the Church’s representative, I have also witnessed marriages, at which rings have been exchanged in the name of the Father, and of the Son, and of the Holy Spirit. We have all been blessed – and have blessed ourselves - in the name of the Father, and of the Son, and of the Holy Spirit. Finally, the principal prayers of the liturgy are all addressed to the Father, through the Son, in the unity of the Holy Spirit. In short, my entire life – and the lives of all of us, both individually and as a Church community – have been defined, formed, and shaped by the awesome mystery of who God is, that defines the Triune God’s relationship with us and ours with God. Admittedly, the words we use to talk about the Trinity, words like “nature” and “person,” when used not as we use them in ordinary language, but as arcane technical terms of philosophical language, may seem – especially perhaps to post-modern ears – to be much too abstract. For all its apparent abstraction, however, the doctrine of the Trinity is our fundamental – and uniquely Christian – insight into who God is. It distinguishes Christian faith from all other religious beliefs – including the other monotheistic religions. Human beings, created in the image and likeness of God, have a built-in, natural longing for God. As St. Augustine famously said, “You have made us for yourself, and our heart is restless until it rests in You.” Yet, while the existence of a God may be knowable by the natural light of human reasoning, who God is in himself, however, is something we could never know on our own. That had to be revealed to us. Hence, God himself has revealed who he is – one God in three distinct Persons: Father, Son, and Holy Spirit. We do not worship three gods, but one God – a unity of Persons in one divine nature or substance. Each of the three Persons, Father, Son, and Holy Spirit, is truly God. They are not three modes or appearances of God, but three identifiable Persons, each distinctly God, but in relationship to each other, that is to say, their distinction resides solely in their relationship to each other: the Father to the Son, the Son to the Father, and the Holy Spirit to both. There is a famous 15th century icon which purports to portray the Trinity, utilizing an ancient tradition of imaging the 3 Persons of the Trinity in the story of God’s appearance to Abraham in the form of 3 angels. In that icon, the Father is seated on one side, gazing lovingly at the Son (the most public figure in the picture, who is seated prominently in the center, gazing lovingly at the Father), while the vibrantly-robed Holy Spirit is seated on the other side. In this image, the three Persons appear to gaze at each other in mutual, loving communication, into which the Son seems to be inviting us as he points out into the world, even as he continues to gaze lovingly at his Father. On the one hand, the doctrine of the Trinity expresses our uniquely Christian insight into the inner life of God – where the Son is the image of the Father, the Father’s likeness and outward expression, who perfectly reflects his Father, while the Holy Spirit in turn expresses and reveals the mutual love of Father and Son. At the same time, the Trinity also expresses something fundamental about how God acts outside himself. Who God is in himself is how God acts; and how God acts reveals who God is. Already in the Old Testament, God was revealing himself as reflected in personified divine Wisdom: the first-born of God’s ways, poured forth from of old, at the first before the earth [Proverbs 8:22-23]. Our redemption was not some divine after-thought. The incarnation of the Son and our redemption were part of the plan of creation, externally expressing the inner life of God. It is, of course, the Son, one in being with the Father, the visible image of the invisible God, through whom, as St. Paul wrote to the Romans, we have gained access by faith to the grace in which we stand [Romans 5:2]. Risen from the dead and seated at the right hand of the Father, the Son has sent the Holy Spirit upon his Church, which is the Body of Christ and the Temple of the Holy Spirit. In St. Paul’s words, the love of God has been poured out into our hearts through the Holy Spirit that has been given to us [Romans 5:5]. The Holy Spirit is inseparable from the Father and the Son, in both the inner life of the Trinity and his gift of love for the world. The Holy Spirit unites us with the Father in the Body of Christ, the Church. Through the sacraments, Christ continues to communicate the Holy Spirit to the members of his Church. Thus, in the Eucharistic Prayer, at the very heart of the Mass, the priest petitions the Father to send the Holy Spirit, so that bread and wine may become the body and blood of Christ and that those who receive Christ’s body and blood may then be transformed into the image of Christ as participants in the mission of the Church. Homily given at St. Paul the Apostle Church, May 30, 2010. Memorial Day – or Holiday Weekend? After the American Civil War, many communities set aside a special day to honor those who had died in that war. In 1868, Gen. John A. Logan, commander-in-chief of the Union veterans’ organization “The Grand Army of the Republic,” designated May 30 as Decoration Day, for the purpose of decorating the graves of Civil War veterans. The first state officially to recognize the holiday was New York in 1873. By 1890 it was recognized by all of the northern states. The South at first refused to acknowledge the day, honoring Confederate dead on other days until after World War I (when the holiday became the day to remember all American war dead). The alternative name Memorial Day, first used in 1882, became common after World War II and became the holiday’s official name in 1967. The unfortunate “Uniform Holidays Bill” of 1968 then moved Memorial Day to the last Monday in May, beginning in1971. In a Memorial Day address in 2002, the VFW observed: "Changing the date merely to create three-day weekends has undermined the very meaning of the day. No doubt, this has contributed greatly to the general public's nonchalant observance of Memorial Day." So we are left with the question: Memorial Day – or Holiday Weekend? Much as the banal concept of the weekend has helped eviscerate Sunday, as “the Lord’s Day,” I suspect the holiday weekend has likewise diminished the social and civic significance of so many American holidays – an impoverishment to our common cultural life, no doubt, but one that is likely here to stay. That being said, it may still be worth the effort to remember what Memorial Day was supposed to be about. 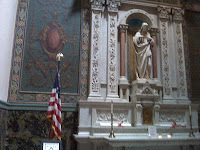 During the Second World War, at the Sacred Heart altar in the south aisle of St. Paul the Apostle Church, there was an easel with the names of all parishioners serving in the Armed Forces and also a plaque with the names of all Paulist priests serving as military chaplains. After the war, a Commemorative Tablet, with the names of those parishioners who had given their lives for their country in that war, was placed on the west wall. 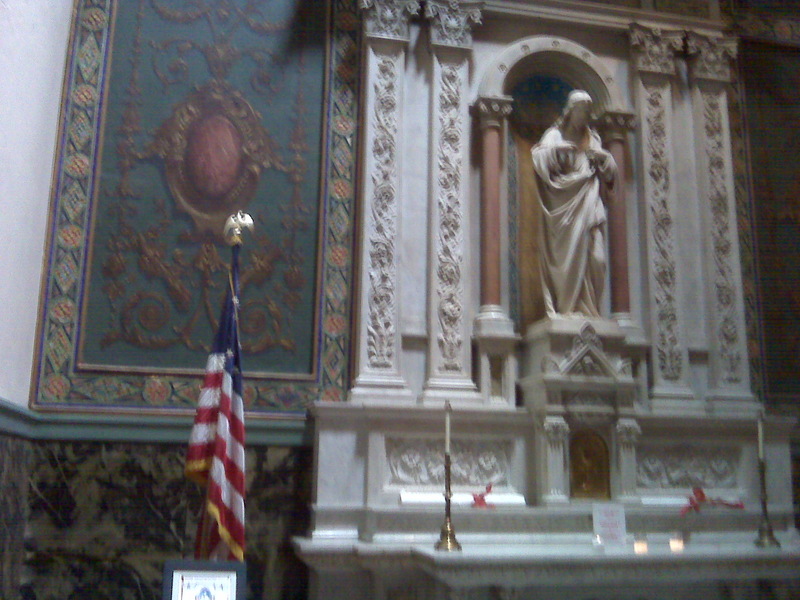 After the September 11, 2001, terrorist attack, the Sacred Heart altar again served as a site to honor the memory of those who had died as a result of that terrible event. A more permanent memorial was designed in 2005, now located to the east of the altar, dedicated to the memory of all who worshipped in this church or who lived or worked in our neighborhood and who lost their lives on that tragic, never-to-be-forgotten day. When my European friends ask why we Americans seem so willing to tolerate poor public services (or, more to the point, seem so unwilling to pay collectively for better ones), or why we seem so reluctant to restrict gun ownership, etc., I generally respond by recalling the priority placed on freedom among American values. It is not that individual freedom and autonomy are the only values most Americans care about. Most Americans, thankfully, are not libertarians. But it is the case that in their hierarchy of values individual freedom and autonomy generally matter more to Americans (mostly descendants of immigrants who left more authoritarian societies behind to find opportunity here) than they seem to matter to many in other societies. The result is that we are more disposed to sacrifice in those other areas in order to maximize our individual freedom and autonomy. Society and community also count in the American story (sometimes very prominently), but the overall narrative more often than not prioritizes freedom and autonomy over society and community. Perhaps that is why, despite the continued prominence of religion and the generally conservative tenor of our culture, the individualistic “sexual revolution” of the 1960s has so successfully institutionalized itself. For decades now, our society has been divided along moral and cultural fault lines that continue to replay the conflicts of the 60s. In one sense, the revolutionary changes (sexual and otherwise) associated with my “Baby Boomer” generation’s behavior in the 60s (including the turn to a much less civil style of political discourse, which has since metastasized beyond anyone’s expectation) may represent a real wound to the Body Politic. At the same time, however, it is evident that such changes have penetrated deeply into the general culture, resulting in a widespread willingness to accept, condone, or at least tolerate all sorts of behaviors which would undoubtedly have been condemned (even if hypocritically so) a few decades ago. Thus, abortion proponents have very successfully framed their advocacy of access to legal abortion not in terms of what it means for its victim, the unborn child, or its effects upon society at large, but rather as an issue of the individual’s right to choose. Such an approach carries enormous weight. It resonates with the American narrative of freedom. In the case of abortion, however, the stakes are so high and the damage done so dramatic that the opposition to its legalization has remained strong in spite of everything. On so many other issues, however, issues on which reasoned debate about the social implications and consequences of this or that might seem warranted, once the issue has been framed in terms of the narrative of individual freedom, the end result is almost inevitable. Such is the constraining power of the American story. By breaking apart the post-war consensus on basic issues, however, the 1960s opened the door to reimagining everything that had been inherited – including the values and practices of the Liberal Welfare State (even in its admittedly modest American version). As the storied accomplishments of post-war prosperity suddenly seemed to be on the wane in the 1970s, opposition to the Liberal Welfare State got a new lease on life. Successfully tapping into the narrative of freedom and autonomy, the “Reagan Revolution” of the 1980s also resonated with the American story. If Bill Clinton represented the inevitable institutional triumph of the 60s, his “New Democrat” orientation also embodied an acceptance of many of the ideas of the 80s. His successor, George W. Bush, may have identified more ardently with those 80s ideas and may have been more strongly supported by those still seeking in part to overturn the 60’s. Yet commitment to that latter goal always seemed secondary. It is a popular political stereotype that “liberals” promote personal and sexual autonomy while repressing economic liberty, and that “conservatives” promote the latter while repressing the former. While that may well be true at the more intensely ideological extremes, my impression is that most of those in the center seem to have accommodated autonomy in both areas within the overarching freedom narrative that is the American story. The current economic crisis may have emboldened the hard-core ideological left, but it has not resulted in any wholesale abandonment of the narrative of economic autonomy that so successfully reasserted its place in the American story in the 1980s and after. No solution to our current cultural and political impasse stands any serious likelihood of success unless it too can be convincingly expressed within some form of the American story’s freedom narrative. That applies as well to approaches rooted in other (e.g., religious) narratives. Until modern times, Pentecost was observed as one of the greatest festivals of the church year, on a par with Easter. It had an octave equal to Easter’s, and even had its own Saturday morning vigil (complete with prophecies and a blessing of baptismal water). At one time, Kings and Queens were expected to wear their crowns publicly on Pentecost. About all that’s left of all that now, in post-Christian Europe, is the 3-day Whitsun weekend. That’s not unlike the situation with our 3-day weekend next week. Until relatively recently, what we still nostalgically call “Memorial Day” was a real civic holiday with meaning and social significance, not just another excuse to contribute further to climate change and do other environmental damage by driving to the beach or to the mall. “Pentecost” is a Greek word referring to the 50th day – originally the 50th day after the Passover. Its Hebrew name, Shavuot, means “weeks,” a reference to the week of seven weeks that began with Passover. Originally an early summer thanksgiving feast at the time of the ancient Israelite wheat harvest, Shavuot was the second of the three great pilgrimage feasts in the Jewish calendar – the first being the spring feast of Passover and the third the great autumn harvest festival of Sukkot, which the New Testament typically calls “the Feast of the Tabernacles.” Pentecost originated as a joyful thanksgiving for the early summer harvest of grain, strawberries, cherries, peas, and asparagus. Two loaves, made from new flour, would be offered to God as the first fruits of the grain harvest. Whereas at Passover seven weeks earlier unleavened bread had been offered, at Pentecost ordinary bread was offered in the form of fully leavened loaves. Shavuot is celebrated on the 6th day of the 3rd month of the Jewish calendar – 50 days after Passover. By New Testament times, Shavuot had become a commemoration of the covenant at Mount Sinai, the giving of the 10 Commandments, which (according to Exodus 19) all happened just about 7 weeks after the exodus from Egypt. It was to celebrate Shavuot that "devout Jews from every nation under heaven" came as Pentecost pilgrims to Jerusalem, in the familiar story read today from the Acts of the Apostles (Acts 2:1-11). Just as summer fulfills the promise of spring, the covenant at Mount Sinai fulfilled the promise of Israelite nationhood of which the exodus had been but the beginning. And, just as the covenant at Mount Sinai fulfilled the promise of Israelite nationhood, of which the exodus had been but the beginning, likewise the coming of the Holy Spirit fulfilled the promised of the resurrection, transforming the disciples from fear-filled followers of a now absent Jesus into faith-filled witnesses commissioned to transform the whole world – beginning with that initial polyglot group of Pentecost pilgrims. In our liturgical calendar, Pentecost marks the transition from Easter to Ordinary Time, the time of fulfillment, the time of the Church, when the promise of Christ’s resurrection should be reflected in our ordinary lives. As his Church, we worship the Risen Lord, now ascended to glory and seated at the Father’s right hand. Meanwhile, as his Church, we continue Christ’s life and work in the world. According to Acts, there were 120 persons present in what tradition calls the Upper Room. Artistic renditions often focus particularly the 12 apostles along with Mary, the Mother of Jesus. In a famous mosaic in the dome of the Basilica di San Marco in Venice, however, the 16 nationalities (Parthians, Medes, Elamites, etc. ), who are mentioned in the story as having heard the Gospel preached in their native languages (thus undoing the damage done to the human community as a consequence of the Tower of Babel) are all represented in the scene, each by a male and female pair (an image of the universality of the Church). Many of us, when we were back being prepared for Confirmation, memorized the 7 gifts and the 12 fruits of the Holy Spirit. Today’s gospel promises that the Holy Spirit will teach us everything and remind us of all we have been told. So let’s recall what we all learned long ago. The 7 gifts of the Holy Spirit are … wisdom, understanding, counsel, fortitude, knowledge, piety, and fear of the Lord. We call these gifts of the Holy Spirit, because we don’t start with them or produce them on our own. They are given to us – to transform us into true children of God and coheirs with Christ, to enable and empower us to live in a new way and thus fulfill the Church’s mission in the world. The results of that transformation, the visible effects we experience and recognize of the Holy Spirit at work in our lives are what we customarily call the 12 fruits of the Holy Spirit. And they are … charity, joy, peace, patience, kindness, goodness, generosity, gentleness, faithfulness, modesty, self-control, and chastity. That’s how the promise of the resurrection is fulfilled and expresses its effect in our ordinary lives, which is the point of Pentecost. Pentecost is thus the annual liturgical observance of what happens every week with the transition from Sunday to Monday. From our Sunday celebration around the unleavened bread which has become the body of our Risen Lord, we are sent forth, to renew the face of the earth as one body and one spirit in Christ, as the Risen Lord’s permanent presence in the leavened bread of our daily lives in the world. In that sense, Easter doesn’t end at Pentecost, and Sunday doesn’t end on Monday, anymore than Mass ends with the Dismissal. We do indeed depart, but we do so changed and energized – sent forth in the power of the Holy Spirit to renew the face of the earth. Homily given at St. Paul the Apostle Church, May 23, 2010. 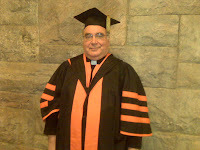 Officially representing the parish at the Marymount Baccalaureate event to be held at St. Paul’s this afternoon, I will be wearing my Doctoral Academic Gown for the first time in many years. (I had to fish it out of my closet and re-learn how to wear it and attach the hood correctly!). A fuller face and the clerical collar clearly identify the picture as 2010 - not 1977! The orange-and-black color scheme may make it look like Halloween, but the orange stripes, etc., have serious historical significance. The orange represents the royal house of Orange (the currently still reigning house of the Netherlands) and recalls Prince William of Orange, the Dutch Stadholder and son-in-law of England’s King James II (James VII of Scotland), who in “the Glorious Revolution” of 1688 successfully invaded England (the last successful cross-channel invasion in that direction) with the help of a “Protestant Wind.” Promising to “defend the liberties of England and the Protestant religion,” William chased his father-in-law out of the country and established himself and his wife as King William III and Queen Mary II. Founded by “New Light Presbyterians” in 1746 as part of the “Great Awakening,” Princeton University’s particularly Protestant origin is thus reflected in the Orange color scheme, which recalls the Glorious Revolution’s successful overthrow of England and Scotland’s last Catholic king. I don’t know what it’s like now now at Princeton in an increasingly secularized society, but, when I was a graduate student in 1970s, Princeton still had a real-life Scottish Presbyterian Dean for its University Chapel where an official chapel service along Presbyterian lines took place every Sunday. 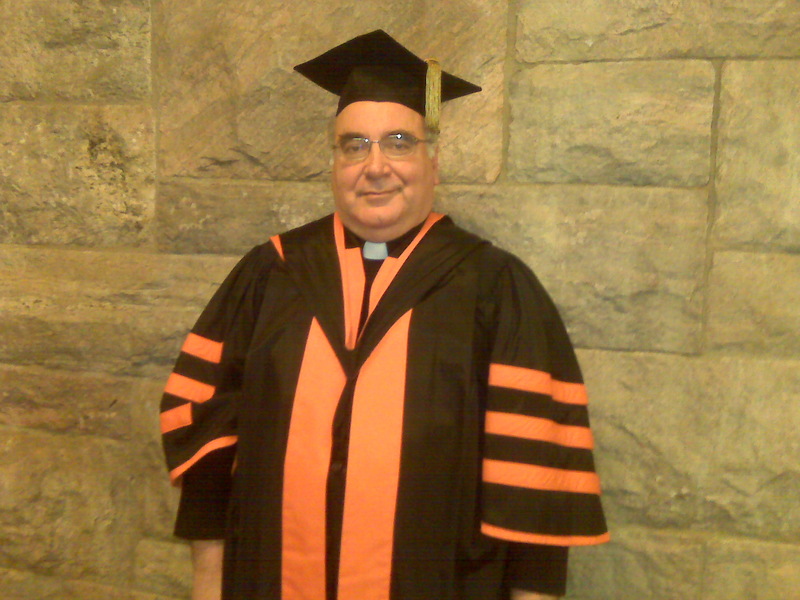 My Princeton Ph.D. commencement in 1977 featured the great hymns “God of Our Fathers” and “Faith of Our Fathers.” Such symbolic externals are important, of course, but even more important for my personal education was the presence on the faculty of Professor of Christian Ethics, Paul Ramsey, perhaps the foremost American Protestant ethical theorist of the 20th century (after the two Niebuhrs). I had the privilege of auditing Ramsey’s undergraduate lectures and enrolling in one of his doctoral seminars. It was quite a heady experience, enormously helpful for my interest in theological political theory, with long-term personal impact as well. So as I put on my sometime academic attire today, I recall the incomparable role played by profound Christian faith and commitment in the founding of this great country and its great universities, and am left to wonder what our society would be like today if only we had remained faithful to our relgious heritage! For our parish book discussion this month, we veered slightly from the “Great Catholic Fiction motif” to embrace the great Protestant classic, The Pilgrim’s Progress, first published in 1678, long considered one of the most influential religious books ever written in English, and since translated into many other languages as well. Although I’d known about The Pilgrim’s Progress all my life, this was in fact the first time I ever actually read this superb expression of Reformation sensibility – so obviously germane to the type of Protestantism which so strongly influenced American society at its very beginning. And so on … (You get the picture). In an earlier, more religiously literate age, the allegories and scriptural references would undoubtedly have been readily recognized and appreciated. The idea would have been for every ordinary (Protestant) Christian to recognize his or her own spiritual journey in the tale. More broadly, the fact that Christian must ultimately make this pilgrimage more or less on his own (admittedly with lots of help along the way) undoubtedly reflects the individualistic premise presumed by the Reformation theology. (In The Pilgrim’s Progress, Second Part, which appeared in 1684, Christian's wife and children also make the pilgrimage, showing that women no less than men are capable of the journey out of this world to salvation, and indeed that ordinary, less heroic, even frail people can become pilgrims). In our discussion last evening, I invited the group to try to imagine what a competing Catholic version might have looked like. Catholic Counter-Reformation theology promoted a comparably strong spirituality, but one more centered on the Church and the sacraments. The “pilgrim” would likely have encountered many of the same threats and challenges along the way, but would have been assisted and supported in a very different way by the structures of the Church and its sacramental life. More than likely, a Catholic alternative would have highlighted a path to perfection through consecrated religious life. Those not called to such a life, however, would not necessarily have had to stay behind in the “City of Destruction,” but would have relied on the structures of the Church and its sacramental system to help them along. Part of the distinctive religious dynamic of the Reformation, with all sorts of subsequent social ramifications (as Max Weber and others have shown), was that by abolishing the special path to personal perfection proposed by consecrated religious life, the Reformation, as has been said, made “every man a monk,” sending everyone (or at least everyone who cared about his or her salvation) along that strenuous pilgrim path. 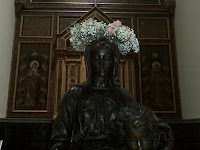 Yesterday after the Sunday 10:00 a.m. Mass, it was time for the parish’s annual “May Crowning” of the Statue of the Blessed Virgin Mary. In recent years, this popular tradition has been carried out on a weekday afternoon. This year, however, it was moved to a Sunday with much of the children’s religious education program present and the full panoply of musical and other embellishment only feasible in a Sunday celebration. Yesterday’s celebration was also heightened by the participation of a large visiting choir that had sung at the Mass and then gave a concert afterwards (part of the successful Visiting Voices at St. Paul’s program). One acquaintance expressed to me his personal view that kings and queens are incomprehensible images for contemporary people. Besides noting the obvious political fact that there are still a good number of monarchies around in the world – at last count, Europe alone counted 8 states and 2 mini-states with a hereditary monarch at the head – I couldn’t resist asking my friend if he had learned any fairly tales growing up. (Since he is older than I , I am sure he must have heard all those familiar tales in his day, as I did). As such familiar stories certainly show, kings and queens are deeply embedded archetypical figures in our common human consciousness. As a sometime political scientist, I would also observe that through most of human history few, if any, civic symbols have served so successfully at building, bonding, and unifying social communities as has the institution of kingship. In the institution of kingship, a particular person (whose whole identity is connected with this role) symbolically unites an entire community by a powerful personal bond – a bond so powerful precisely because so personal. Luke’s Gospel identifies Jesus even before his birth with messianic significance of David’s kingship over Israel (Luke 1:32-33). Christian tradition and liturgy have honored Jesus as King - and by extension Mary as queen - with all the symbolic splendor & resonance that those titles convey. How May Crowning originated and developed into a common Catholic custom I don’t really know. 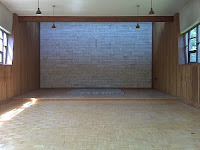 Clearly, however, it is a successful and popular custom, which resonates well with people. By its nature, a “coronation” highlights the grandeur and special significance of the person being crowned. 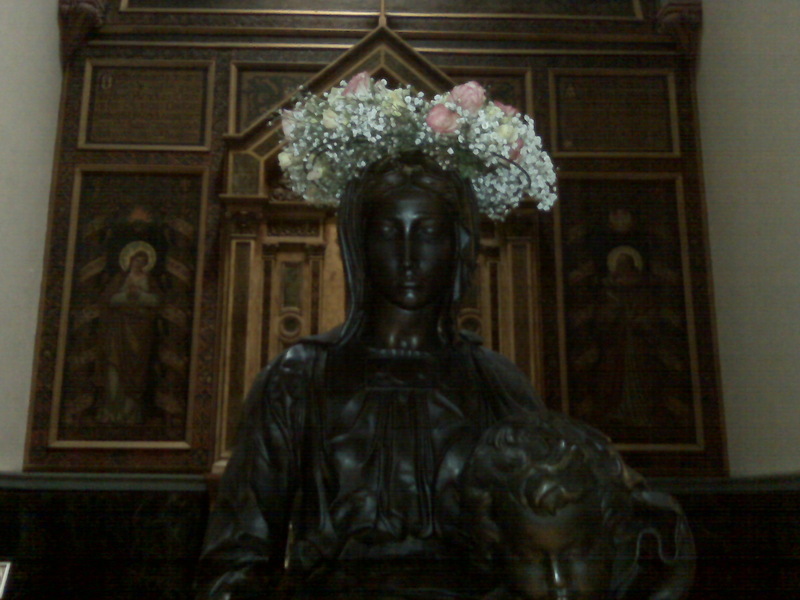 At the same time, the traditional use of a floral crown in the customary May Crowning gives it a somewhat folksy character, which I suspect further endears it to people. All those themes coalesced quite vividly in yesterday’s celebration. I can only hope the experience may have helped overcome some of my friend’s curious qualms! It’s no accident that the official book that lists all the saints (on their appropriate days) is called the Martyrology, for the martyrs have always held a place of special honor in the Church’s memory, from the very first century right down to the present. Speaking at the canonization of the 19th-century Ugandan martyrs in 1964, Pope Paul VI, after recalling the famous early Christian martyrs of Africa, said, “Who would have thought that in our days we should have witnessed events as heroic and glorious?” In fact, martyrs have been as central to the experience of the Church in modern times as in ancient times, and the last hundred years have probably produced more martyrs than any previous century in the Church’s history! But of all the martyrs, the story of Stephen, the first martyr (told in chapters 6-7 of the Acts of the Apostles), has always stood out – largely because he was the first, but also because the story of his martyrdom is so reminiscent of the story of Jesus himself and thus exemplifies so well what every martyr’s death (and every Christian’s life) is supposed to be. “Lord, do not hold this sin against them,” said Stephen before he died – words addressed to the Risen and Ascended Jesus in obvious imitation of the crucified Jesus’ own prayer to his Father. And an obvious moral to be drawn from the story of Stephen’s martyrdom is that, just as Jesus forgives, so also anyone who identifies with Jesus must forgive! Of course, when it comes to the actual practice of forgiveness, we seem somewhat ambivalent. Nor should that surprise anyone. Forgiveness is not easy. It does not come automatically or naturally. Anger, resentment, and the desire for revenge all seem so much more natural. Given what we see of Stephen’s character as suggested by his combative evangelizing style, it’s possible that forgiveness may not have come so automatically or naturally to him either. Yet somehow Stephen was able to get beyond normal natural feelings – precisely because something new had happened to him, because of who he had newly become by having identified himself with Jesus, through whom he had already experienced the freeing forgiveness of God. The experience of being forgiven, of course, presumes we recognize our own need for forgiveness. Receiving and giving forgiveness is always a challenge. If anything it may be even more so today when accepting responsibility for our own actions has somewhat gone out of style and has given way to a corrosive culture of victimhood, blame, and litigiousness. (We saw some of that on display again this week with the congressional hearings on the oil spill). But really to receive forgiveness and to be really healed by it presumes we can recognize, on the one hand, how we are all in this together and share the universal burden of sin and, on the other hand, our own individual need for forgiveness. That is why we begin our Mass most days with a ritual of repentance. We do not come to Mass to be told that we are sinners. We know that already, and that is precisely why we come to Mass. We come to experience the presence of the Risen Lord and his forgiveness in our lives. Forgiving others can certainly be usefully presented in secular terms – as some sort of healing process, as a way out of passivity and victimhood, as turning a more hopeful page to enable one to get beyond individual resentments and conflicts and to get on with one’s life. And that’s all fine and good – as far as it goes. But Stephen went further, experiencing a real bond with his persecutors not for his healing but for theirs, thanks to a transformed life lived in union with the Risen Jesus, who heals and empowers his disciples, unburdening them with the freeing forgiveness of God. Homily at St. Paul the Apostle Church, May 16, 2010. That’s the New York Botanical Garden, to be precise (formerly and more properly known as the Bronx Botanical Garden)! I went there today – walking distance from my childhood home - as part of a parish outing to enjoy the beauty of the Botanical Garden’s justly famed outdoor gardens, plant and flower collections, conservatories, and uncut forest. 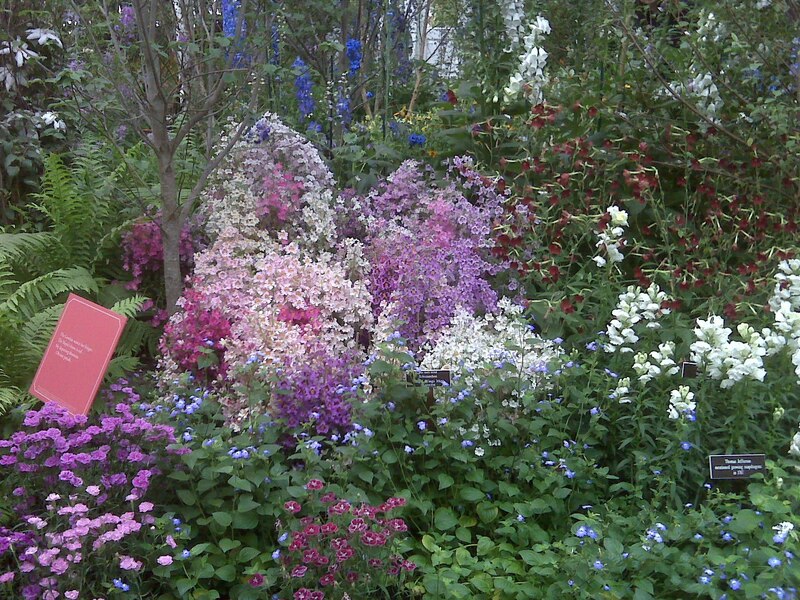 We also went to take in the current special spring exhibit - Emily Dickenson’s Garden: The Poetry of Flowers. Emily Dickinson (1830–1886), who lived a strange reclusive life with her family in Amherst, Massachusetts until she died of Bright's Disease on this day in 1886, was perhaps better known in her lifetime for her gardening than for her poems. Her poetry has long been a part of the American literary canon which was in fact (along with her other writings) significantly influenced by plants and flowers. When I first encountered Emily's poetry in High School, I remember learning of her reclusiveness, but how much of a hermit she really was, or why, were beyond the borders of the curriculum. She obviously had direct regular contact with her family and, presumably, with the family's Irish servants, and she carried on a written correspondence with some 100 or so others. So she was hardly a hermit, but very definitely a recluse, living an oddly abnormal life. Over the years, her self-inflicted social isolation has been blamed (surprise!) on an early romatic disappointment. At least one mid-20th century author theorized a failed lesbian romance. Who knows? All such speculations could, of course, be true - or false. Either way, they reflect our contemporary desire to re-interpret people and events from the past to fit present preoccupations - an interest in reinforcing ideological obsessions and scoring political points. Be all that as it may, it is a great exhibit, well worth the trip - as is the entire Botanical Garden itself. New York's Bronx Botanical Garden is a park, where people can go to enjoy being out-of-doors. It is a nature center, where people can experience the beauty of the natural world and actually learn a good deal about it. And it is a scientific research center, where serious scholarly study takes place. What a great thing to have this wonderful treasure as part of our city! Another Supreme Court nominee, another Senate confirmation silly season! Presumably, we will soon be treated to a summer of predictably probing questions about the nominee’s judicial philosophy and equally predictable non-answers on her part. Presumably also, when all the predictable posturing on both sides is over and the noise has died down, she will be confirmed by an equally predictable margin. And who is to say what kind of Justice she will turn out to be in the end? Who is to say that she won’t in the end turn out to be a wonderful choice for the country? There is, it seems to me, at least one indubitable merit to her nomination. For the first time in quite a while, someone is being nominated who has not been a judge. In the past, of course, this would hardly have raised any eyebrows. One recalls, for example, that icon of judicial activism, Earl Warren, former Republican politician and Governor of California, who had never been judge before being appointed to the Supreme Court by President Eisenhower. And, however one evaluates them on other grounds, Sandra Day O’Connor’s opinions and general judicial philosophy certainly reflected – and were enriched by - her own prior experience as a politician and state legislator. Given the enormous power wielded by this unrepresentative, anti-democratic, elitist institution, the least we as a country should hope for is that, in its composition, the Court might be in some serious sense somewhat more representative of our society’s values in all their diversity. So, while I applaud the nomination of someone who has never been a judge, I rather regret that the appointment is so unrepresentative in other respects. Assuming her confirmation, she will be one of 4 Supreme Court Justices who consider themselves New Yorkers – interestingly one each from 4 of the 5 boroughs. New York is, of course, a much more diverse a place than many non-New Yorkers who know so little about the real New York give it credit for. More problematic than the New York connection perhaps is the Ivy League background – not that there is anything wrong per se with being an Ivy Leaguer but that there are already enough of them on the Court. One is reminded of William F. Buckley’s famous line -something to the effect that he would rather be governed by persons randomly taken from the Cambridge telephone book than by the members of the Harvard faculty. Of course, the real problem is the unrepresentative, anti-democratic, elitist character of the Court as an institution and the resulting damage done to our political life in recent decades by its decision-making in matters more properly left to the political branches. Accepting that as a given, however, it would certainly be helpful if the Justices’ background, education, previous careers, and general life experience were more diverse and more widely reflective of American society, more respective of the diversity of our citizenry and their values. Centuries ago, there were many more holydays of obligation. Today, they are few – all the more reason, therefore, to treasure them, these few and far between days when religion intrudes itself into the secular routines of weekday life. Here in New York City, Ascension Thursday even warrants the suspension of “alternate-side-of-the-street” parking regulations! Some of us, I suspect, may be old enough to remember when, right after the Gospel on Ascension Thursday, the Easter Candle – the visible symbol of the Risen Christ – would be ceremonially extinguished. 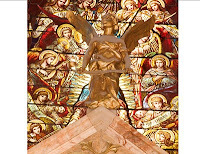 In earlier ages, the Candle – or sometimes an image of the Risen Lord himself – was sometimes hoisted up into the Church’s ceiling until it disappeared. The people would look up and stretch out their arms, while a shower of roses would recall Christ’s parting promise to send the Holy Spirit to his Church. Such customs recall those familiar pictures of the Ascension, that show the disciples staring up at an empty space – sometimes with 2 feet sticking out from a cloud (with holes in them, just to make sure we understand who is missing). The point of all such images, of course, is that Jesus is now gone. Historically speaking, the Ascension commemorates the end of the Risen Christ’s series of appearances to his disciples in the period right after his resurrection. According to the Acts of the Apostles, the Risen Lord presented himself alive to the apostles whom he had chosen, appearing to them during forty days and speaking about the kingdom of God (cf. Acts 1:2-3). Then, those appearances ended; and the disciples were left on their own. Well, not quite on their own, obviously, since Christ continues in his Church through the gift of the Holy Spirit. “And behold,” the departing Jesus said to his disciples, “I am sending the promise of my Father upon you, so stay in the city until you are clothed with power from on high” (Luke 24:49). The point of the Ascension is not so much that Jesus has gone but where he is now - seated at the right hand of the Father, as we say Sunday after Sunday in the Creed. As we say today in the Eucharistic Prayer: We celebrate that day when your Son, our Lord, took his place with you and raised our frail human nature to glory. That means that God now has with him in heaven the human world his Son embraced in himself and experienced to the full – the world of our lives, our loves, our work, our play, our successes, our failures. And now, having experienced our world with us (in the process, investing it with more meaning than it would ever otherwise have had), God in turn now shares his world with us. For where Christ has gone, there we hope to follow (Ascension Preface). Where he is now, there we hope to be. Thus the Ascension is ultimately also about us, about what’s in store for us thanks to Jesus’ resurrection. The Ascension sets the stage for that hoped-for future, made possible in the present through the gift of the Holy Spirit, who makes possible our unique life in this world as Christ’s Church, in which, although he no longer walks the earth the way he once did, Jesus is still alive and remains very much with us. Unlike most farewells, which tend toward nostalgic recollections of the past, Jesus’ parting words to his disciples in chapters 13-17 of John’s gospel focused on the future – on their future as Christ’s Church, continuing his life and work in the world and characterized (so Jesus has promised) by his parting gift of his peace. How striking then to turn to the Acts of the Apostles and encounter not peace but conflict! What we now call the Easter season has its origin in the newly baptized Christians’ need to process what they had experienced at Easter and our need to identify with them in their experience and so be renewed in our own baptismal commitment. And what better model for this that the Acts of the Apostles – the Evangelist Luke’s inspiring story of the Apostolic Church’s internal life and external expansion into the pagan Roman world. Reading Acts every day during Easter time is intended to recapture and renew for us the enthusiasm and excitement that characterized that 1st Christian generation’s experience. But excitement and enthusiasm are not the same as peace and harmony – at least not as we usually understand those words. But then the peace promised by Jesus was, quite explicitly, not as the world gives. In today’s 1st reading (Acts 15:1-2, 22-29), we encounter another dimension of the Church’s life, conflict – conflict that went to the very heart of what the Church would be about. And we also see how (and how successfully) that conflict was resolved. The cause of the conflict was the Church’s success in proclaiming the gospel among the Gentiles. Now nobody was saying that a Gentile couldn’t be converted to the worship of the true God and of Jesus as the Messiah. But the way to do that would, presumably, have been to be “circumcised according to the Mosaic practice” – in other words, to become Jews first in order to become Christians. Instead, it appears that pagans were being baptized into the Christian community without going through that intermediate step. Hence the conflict – how to understand the relationship between Jews and Gentiles in God’s great plan to save the world through Jesus. Well, we all know the solution. Just as Jews could become Jewish Christians, so too Greeks could become Greek Christians, but they would remain Greeks, not becoming Jewish. Likewise Romans could become Roman Christians, etc. This radical decision simultaneously established both the universality of the good news of Christ to all peoples without exception and recognized diversity within that, what in today’s terminology we would call the Church’s “multi-cultural” character. Historically, this event was decisive. It made it possible for Christianity to expand throughout the ancient world and to continue to expand today into a truly global community. In the ancient Mediterranean world of small city-states, the greatest thing one could be was a citizen, entitled to participate fully in the community’s life through discussion and debate. But citizenship as an active way of life as opposed to just a passive possession of certain privileges had seriously deteriorated as the small city-states were all absorbed into an enormous empire. Popular participation through discussion and debate had diminished, and people seemed to have lost the sense that they could accomplish anything that way – not unlike, perhaps, what seems to be happening in our public life today. So often we feel so overwhelmed by problems – rather than challenged by them – and so react passively, as if we were silent spectators in the story of our lives. But that first Christian generation felt empowered to resolve the problem they were faced with – not by arbitrary action or some secretive decision, but by confidently open discussion and debate. The history of the Church was irrevocably shaped by this event, both in process and in outcome. The “Council of Jerusalem,” as this event retrospectively came to be called, became the model for all the subsequent councils, whether local or universal, which throughout the Church’s history have enabled the Church to come to grips with new and pressing problems. As a result, Church is an all-inclusive, yet widely diverse society, a jewel whose distinctive sparkles gleam with the splendor of the Risen One who has brought us all together to be one people and who has empowered us with his peace – not a peace which avoids conflict or tries to hide it, but an active peace which embraces the challenge to transform conflict wherever and whenever we experience it. Not quite peace “as the world gives” peace, but precisely the kind of peace the world needs. 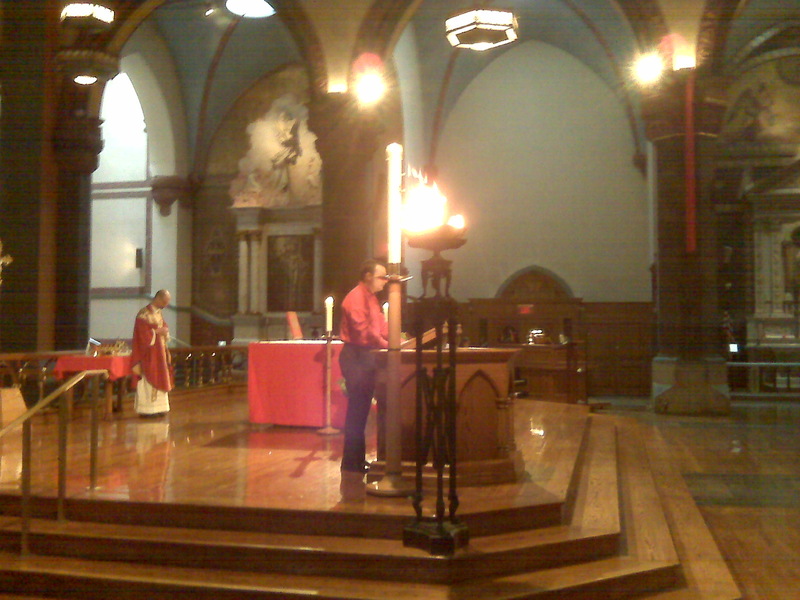 Homily given at St. Paul the Apostle Church, May 9, 2010. 65 years ago today, the War in Europe ended. Germany actually surrendered unconditionally on May 7, but it was the following day which was celebrated as V-E (“Victory in Europe”) Day by the victorious Western Allies. (In a sign of troubless to come, the Soviet Union refused to celebrate on the same day. So Soviet V-E Day was May 9). That was certainly true of my father. There were occasional exceptions, when we would draw out of him some wartime memory – like what it really felt like when crossing the Channel in June 1944. And then there was his map, meticulously (and somewhat artistically) recording his service in Europe - a map I am proud to have hanging in my office today. Even when we did draw something out of him, however, he tended to play down the excitement of it all. If anything, his emphasis seemed more on how scary the whole experience was, which, I suspect, probably reinforced his natural inclination to be a calm, peaceful, and patient person himself. A hardworking breadwinner, when things were much more difficult than they later became, he understood what his priorities were – and that there were much more important things in life than excitement. He aspired to and lived a quiet life, a life of patience, generosity, and, above, all family – his wife of 52 years (whom he loved from the day they first met at a soap sale in Macy’s soon after the war), his 3 children, and, in his last years, his grandchildren, plus his brother and 4 sisters, their husbands, children, and grandchildren, the whole extended clan, the famiglia, to whom he remained devoted to the end. He always understood that family means people, to be loved and cherished, whoever and however they may turn out to be. All this was possible for him, for his family, for an entire nation, and indeed a liberated world, only thanks to the great military victory whose anniversary is recalled today – a reminder that such things don’t come for free, and are to be cherished. Recently I saw a Preview of the Picasso exhibit at the Metropolitan Museum of Art. That was interesting in its own way, but I was much more impressed by another special exhibit, The Mourners: Medieval Tomb Sculptures from the Court of Burgundy, in one of the Met’s most serene and beautiful sites, the Medieval Sculpture Hall, where it will be on display until May 23. The “Mourners” are 37 alabaster figures from the 15th century tomb of John the Fearless, Duke of Burgundy, of the House of Valois. The approximately 16-inch tall statues were presumably originally intended to spend the rest of human history on procession through the alabaster arcade at the base of the tomb, beneath the effigies of the duke and the duchess. Originally located in the Charterhouse of Champmol, whose Carthusian monks prayed for the souls of Duke John and his wife, the tomb was dismantled during the French Revolution. Most of the surviving statues were subsequently incorporated in a restoration of the tomb in the Musée des Beaux-Arts in Dijon - where The Mourners will return after the current American tour. As displayed at present in the Met, marching as it were two-by-two, the figures replicate what the Duke’s original funeral procession might have looked like. There is a bishop in miter and crozier, with members of the secular clergy, and Carthusian monks in their habits, and various lay mourners, dressed in thick mourning cloaks, all portrayed in delicate detail. Undoubtedly many of the lay mourners must have been members of the duke’s household and other courtiers. Historically, in addition to the court there would also have been poor people among the mourners – enjoying the benefit of a new outfit of mourning clothes in return for offering prayers for the deceased duke’s soul. The Medieval Sculpture Hall (famous for being the site of the annual Neapolitan Christmas Tree-Creche) is for most of the year a place of unparalleled serene beauty and a fitting place to recall and reflect upon a long gone world which managed to live a dynamically active present while always aware of humanity’s future and final destiny. I go there sometimes just to regain much needed perspective on the things that matter most. The Mourners really help one do this. In my senior year in college, my final assignment in American Political Thought class was to write a Utopia – “America As It Could and Should Be.” So I sketched a (to me at least) charming vision of an America that combined the best (or what I then imagined to be the best) of the fashionable ideas of the early 1970s with particular personal hankerings of my own. The America that I imagined was a society in which citizens were represented according to 3 identities – regional (one’s local community), tribal (one’s ethnic community), and "guild" (one’s work community). Remember that this was the decade of such best-sellers as The Greening of America and The Rise of the Unmeltable Ethnics! Shades of Rousseau, my utopian America was also a society high on symbolic participation – public neighborhood banquets on Sundays, civic parades, etc. It also had a King (reflecting my pseud0-medieval views on the perennial value of sacral kingship), whose job was to preside over the “dignified” dimension of public life. It also had an established Church, and (in an obvious nod to my own ethnic heritage) Columbus Day was its principal national holiday. Reflecting the emerging environmental consciousness of the time, it also embodied a serious ambivalence about technology. Airplanes were used to connect coastal cities with the rest of the outside world, and high speed railroads linked communities throughout the country. Cars, however, were completely prohibited. My ambivalent feelings about technology reflected in that undergraduate paper have persisted. I still despise cars and prefer trains. (My fondness for air conditioning, however, would obviously disqualify me from any “green” pretensions in the area of energy!) Meanwhile, a whole new technological frontier has been passed that was simply beyond my undergraduate imagination in the 1970s. I used a personal computer for the first time in 1994, the internet in 1995, bought my first cell phone in 2001, and upgraded to a blackberry in 2009. Those dates do not suggest someone eager to embrace every new “cool” technology as soon as it became available, but they do suggest a willingness eventually to learn to play according to modern life’s latest rules. Like many in my generation, I remember fondly an earlier, simpler age when we all watched the same network news, before cable TV had fragmented (and polarized) our society into separate niche markets. On the other hand, 90% of my TV watching today is on cable. All these feelings have been stirred up in me again this week by an unexpected, belated birthday gift – a Kindle. A lifelong reader and unrepentant book-lover, I may be both an obvious candidate for a Kindle and at the same time the sort of person who on his own would have been in no real rush to acquire one. If nothing else, my age and my vocation ought to make me resistant to any ostensible “coolness” factor involved in possessing such novelties. And yet, once one starts using such toys, it becomes clear that they possess a certan addictive charm. Every day, during these seven weeks we call the Easter season, the Church at Mass reads from the Acts of the Apostles – the evangelist Luke’s inspiring account of the growth and expansion of the Church from Jerusalem into the pagan Roman world - in the process, eventually transforming first the Church and then even the Empire itself. Today’s excerpt [Acts 14:21-27] resumes the story of Barnabas and Paul at the farthest point of their 1st missionary journey, and follows them as they retrace their steps back to their original starting point, Antioch, where they had been commended to the grace of God for this work in the first place (they weren’t freelancers), and where they now reported, not in terms of what they themselves had accomplished, but what God had done with them and how he had opened the door of faith to the Gentiles. A children’s book about the Acts of the Apostles, that came out a number of years ago, captures this story so well with its title, Good News Travels Fast. In saying that, the apostles were not, I think, talking primarily about their physical ailments or any of the other ordinary difficulties that characterize daily human life, however significant such perennial problems undoubtedly are. They were, rather, referring to the challenge of being transformed from one kind of person to another, the challenge of changing from one way of life to another, the challenge to be a new kind of person, the challenge produced in the present by the power of a radically new future that is already revealing itself in the Church. Such hardships, of course, include the opposition Barnabas and Paul encountered - and which faithful believers will always encounter when the Church is doing its job, in this interval between the old and the new, between Easter and the end. What better illustration of the decisive break between the old and the new than the image of Judas, the personification of the world’s opposition to Jesus and his Church, leaving the Last Supper [John 13:31-35], just as Jesus is about to begin his big speech! Talk about defining boundaries and setting the bar high! The community which Barnabas and Paul were constantly inviting people to join (and were also actively appointing leaders for), that community was not just some social club or mutual aid organization or exotic religious cult – although its attractiveness to people presumably included elements of all those things. It was in fact a new way of being, unmistakably different from the way of being left behind in the world outside, left behind with Judas, and unmistakably different so that the outside world will notice and (hopefully) get the point and be attracted to it! So it was not primarily that outside world which Jesus talked to his disciples about at the Last Supper. His focus was rather on us, how we are to be here with one another – in that new heaven and new earth [Revelation 21:1-5a] already taking shape in the present in his Church. Transformed by the Easter experience, our universal human solidarity in sin is being challenged by our new solidarity in Christ, through whom God really does dwell among us, making us his new people. Of course, a challenge is just that, a challenge. It calls for an ongoing effort. It’s not automatic. We have to want it enough that our daily “Yes” to Christ and his Church really does become also a daily “No” to other options and alterantives. The invitation to embrace a new life within the new community of the Church does not mean pretending that the world has changed, that everything old has suddenly disappeared, or that we are now somehow unaffected by it. It doesn’t mean pretending, for example, that the laws of economics have suddenly been repealed, or that social distinctions between rich and poor, for example, or between citizens and immigrants, have somehow ceased to exist or have somehow lost their significance in the world. But it does mean that those distinctions have no significance whatever here, with us, within the Risen Lord’s Church. As Pope Benedict XVI has written: “Union with Christ is also union with all those to whom he gives himself. I cannot possess Christ just for myself; I can belong to him only in union with all those who have become, or who will become, his own. Communion draws me out of myself towards him, and thus also towards unity with all Christians” [Deus Caritas Est, 14]. Whether at the macro-level of the Universal Church or at the micro-level of one single little parish community, to whatever extent our behavior toward one another contradicts who and what we claim to be, in whatever way our behavior towards one another conceals rather than reveals the presence and action of the Risen Lord, then the word of God may seem silent (precisely when and where it most needs to be proclaimed), and the love of God may appear absent from the very world which Christ came to save. Homily given at St. Paul the Apostle Church, May 2, 2010.